A tall, majestic bird with a “crown” of golden feathers. It has large white cheek patches with a small red patch at the top. They are slate gray with white upper and under wing coverts, black legs, and a black bill. The IUCN Red List describes Balearic regulorum as Endangered. Habitat loss and degradation such as the draining of swamps and marshland for agriculture account for much of the species decline. An additional factor is the illegal removal of these birds and their eggs for a variety of purposes including international trade. 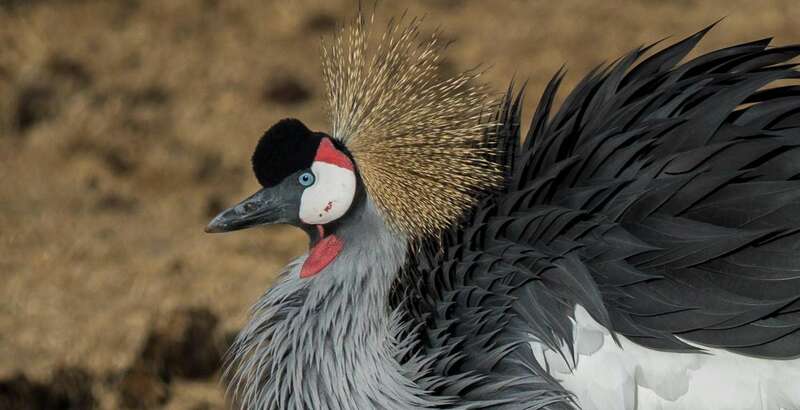 East African crowned cranes are social and gregarious during most of the year, moving about in flocks of up to 100 and roosting in trees or riverbeds. Eastern Zaire, Uganda, Kenya, Tanzania. They are found in marshes and grasslands near rivers and lakes as well as near cultivated land. Omnivorous, feeding on grains, berries, small fruits, tender roots, insect larvae, worms, snails, amphibians, reptiles, small birds and mammals, and a few fish. 22 years in the wild, but the oldest captive crane on record lived for 43 years. Number of young: 2-3 pale blue eggs. Cranes are a symbol of longevity in the Japanese culture. Stamping their feet as they walk, East African crowned cranes flush out insects which are quickly caught and eaten. All cranes are noted for their spectacular dances which involves head-bobbing, wing fluttering, leaps and bows. Both sexes dance, and immature birds join the adults. Dancing is an integral part of courtship, but also may be done at any time of the year.